The Jets had a chance to play SPOILERS on Christmas Eve and end the Los Angeles Chargers’ season in front of their fans on Sunday, but could NOT get the job done. 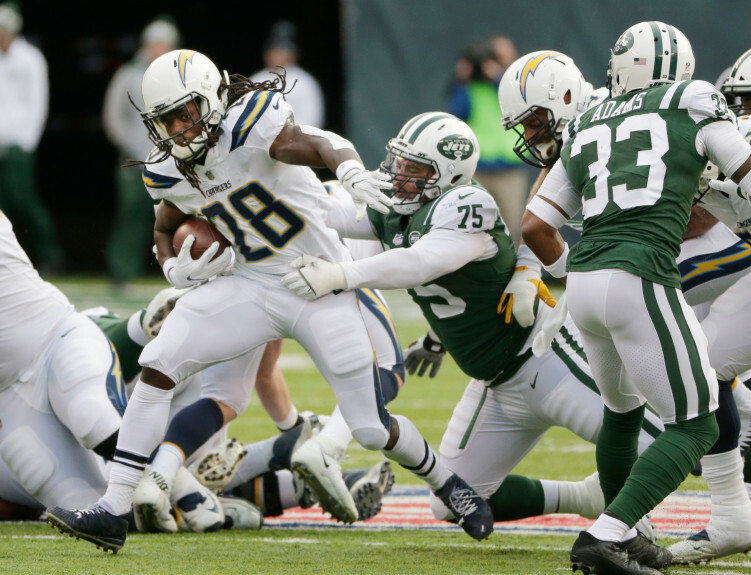 The Jets’ offense looked LOST throughout the game, but the defense could NOT contain the Chargers offense and the Chargers were able to HOLD ON for a 14-7 WIN. The Chargers are still ALIVE for the playoffs going into Week 17, meanwhile the Jets fall to 5-10 on the season and close out their 2017 campaign on the ROAD next week against the Pats. The Chargers had a ROUGH start to their season, but had RECOVERED well over the last few weeks and had a chance to LEAD their division going into Week 16, BUT they lost to the Chiefs last week and were ONE game OUT of the playoffs going into the game against the Jets. The Chargers needed to WIN against the Jets and needed some HELP from other teams around the NFL to get IN to the playoffs. The Chargers are still ONE game OUT of the playoffs going into Week 17, and they still need HELP from other teams in the NFL to get into the playoffs. The Jets were mathematically ELIMINATED from the playoffs last week and were TANKING for a high draft pick this week and that is exactly what happened. With the loss against the Chargers, the Jets remained INSIDE the TOP TEN in the draft order and have a chance to climb as high as FIFTH based on how things shake out next week. The Jets SHOULD NOT WIN against the Pats next week, but that is exactly what is going to happen, since the Jets do the OPPOSITE of what is going to help their long term SUCCESS. This game was an UGLY SLUG FEST in the first quarter as both teams were exchanging punts throughout the quarter. Both offenses looked LOST and barely gained any yards for the MAJORITY of the first half. The Chargers were able to get a touchdown in the SECOND quarter, which was the only score in the first half. The Jets offense was NOT able to get anything going in the first half and the only drive that showed some promise for the Jets, ended in a TURNOVER in the RED ZONE. The only HIGHLIGHT of the game for the Jets on offense was Bilal Powell who had MULTIPLE runs over TWENTY yards. Powell was responsible for the ONLY touchdown for the Jets when he had a FIFTY SEVEN yard run in the third quarter. The Chargers ANSWERED Powell’s touchdown with a LONG drive that ended in a touchdown of their own. That drive took the LIFE OUT of the Jets defense, which was having a good game until then but could not get a STOP on that drive. The two teams kept EXCHANGING punts for the rest of the game. The Jets were able to get into Chargers’ territory LATE in the fourth quarter, but were forced to turn the ball OVER ON DOWNS, which basically ended the game. This game was the SECOND start for quarterback Bryce Petty in the 2017 season and he did not do anything NOTICEABLE. The Jets are still CONSERVATIVE with their play-calling for Petty and do not want him to do too much. Petty showed his MOBILITY with some good runs to escape the PRESSURE in the game, but he has not done enough this season to prove that he should be considered for the starting job next season. The Jets offense was bailed out by Powell, who is the Jets running back for the FUTURE and will be here for the next few years. With Powell and wide receivers like Robby Anderson and Quincy Enunwa, who is OUT for the season with a neck injury, the Jets have ENOUGH pieces on offense to be a formidable offense in the future. They just need to find a quarterback and this team is capable to MAKE the playoffs. The Jets will have a HIGH draft pick next year if they want to draft ANOTHER quarterback. I think that they should look for an established quarterback in free agency rather than drafting a quarterback. Kirk Cousins and Jimmy Garoppolo are supposed to hit free agency this off season, and the Jets should try to sign one of them. There is some UNCERTAINTY as to who is going to make the decisions for the Jets in the offseason. Current Head Coach Todd Bowles and General Manager Mike Maccagnan have done ENOUGH to SAVE their jobs this season, but the ownership might want to go in another direction. If the current decision makers COME BACK, then the Jets are only a COUPLE of players away from contending from the playoffs again. The Jets got ONE of the BEST players in last year’s draft in Jamal Adams, who is going to be considered for the Defensive Rookie of the Year award. Adams has been GREAT for the Jets in the secondary and will be here for the longhaul. Adams manning the secondary and Leonard Williams ANCHORING the front end of the defense, the Jets have TWO of the BEST young defensive players in the NFL. The Jets have some pieces to contend with the Pats for the AFC East next season, but they certainly do NOT have the pieces they need to WIN against them next week. But hey CRAZIER THINGS HAVE HAPPENED in the NFL.